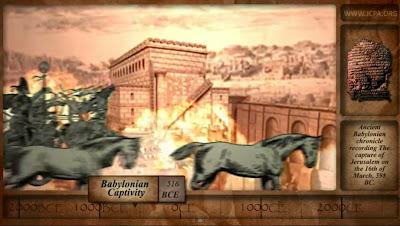 Jewish Humor Central: Jerusalem: A 4000 Year Ride Through Time in 5 Minutes. Fasten Your Seat Belts! Jerusalem: A 4000 Year Ride Through Time in 5 Minutes. Fasten Your Seat Belts! The three weeks between the Seventeenth day of Tammuz and the Ninth day of Av (this year, from July 19 through August 9) is a period during which Jews worldwide lament the destruction of the Holy Temples in Jerusalem so many years ago. With the passage of time, many of the details and dates have become fuzzy and murky to those of us who don't regularly immerse ourselves in the study of Jewish history. So when we discovered a new video, Jerusalem: A Historical Journey Through Archaeology and Art, produced by the Jerusalem Center for Public Affairs (JCPA), that brings the history of Jerusalem to life in an entertaining new way, we thought we'd take a day off from humor and share it with you. What makes this presentation really special is the timeline at the bottom of the screen that moves rapidly from around 1700 BCE to the present day while the story of Jerusalem is being told. You'll feel like a time traveler through the centuries of Jerusalem's conquests by invaders and the persistence of the Jews in returning to their eternal capital. Fasten your seat belts and enjoy!